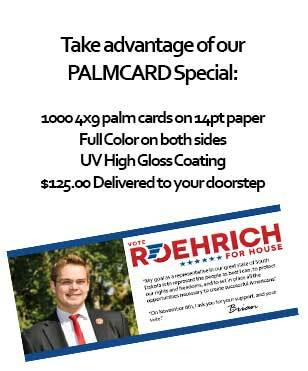 A full-color political campaign brochure is a great way to showcase your platform and educate the voters on key issues. Our higher quality brochures help distinguish you as a “real” candidate from the less-serious contenders – they help build a professional campaign image and create credibility. Our political brochures are full color on both sides in the standard size of 8 ½” x 11″ – and are tri-folded to a finished size of 3 9/16 x 8 ½. There are several paper stocks to choose from, and our friendly customer service reps will help you choose the paper that’s right for your campaign. In addition to printing your political campaign brochures, we can also mail them for you (all of our campaign brochures are designed to be mailed). We offer cost-effective direct mailing services that will free you up your staff from licking stamps.